Amid the cacophony of presidential campaign promises promising huge tax cuts and large spending increases, the Congressional Budget Office on Thursday renewed it’s warning that the Obama administration’s celebrated era of shrinking deficits has ended and that serious long- term debt problems are once again on the horizon. By the end of the current fiscal year, the federal budget deficit will rise to $534 billion – about $100 billion more than last year’s shortfall but slightly better than a previous estimate in January. Then, as a new Democratic or Republican president takes control, the deficit will begin a steady upward march unless the new administration and Congress take steps to slow the rise. Indeed, by 2022, the annual budget deficits will once again exceed $1 trillion a year – pretty much where they were when President Obama first took over seven years ago in the depths of the Great Recession – and will top $1.3 trillion by 2026, according to CBO. By that time, the deficit will be larger as a share of the Gross Domestic Product than anytime over the past half century. 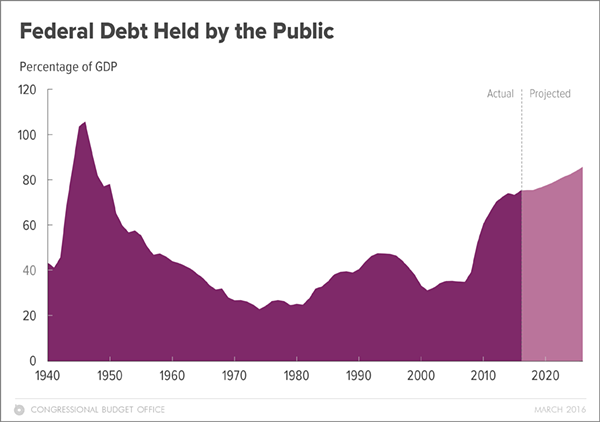 Publicly held debt also would rise significantly and would reach the equivalent of 86 percent of the overall economy by 2026. The latest CBO assessment comes at a time when Republican and Democratic presidential candidates have shown little appetite for discussing austerity, as they try to outdo one another in promising voters major new spending initiatives and, in most cases, deep tax cuts that would further drain the federal coffers and drive up the deficit. Sen. Bernie Sanders, the Vermont democratic socialist who is challenging Hillary Rodham Clinton for the Democratic nomination, has proposed an estimated $18 trillion in long-term spending to provide universal health care coverage to Americans, free state college tuition, family and sick leave benefits and expanded Social Security benefits, just to name some. A new study by the Committee for a Responsible Federal Budget on the Democratic and Republican presidential candidates’ spending proposals released Thursday found that Sanders’ proposals would raise federal spending by 33 percent above current projections for the coming decade, as a percentage of GDP. 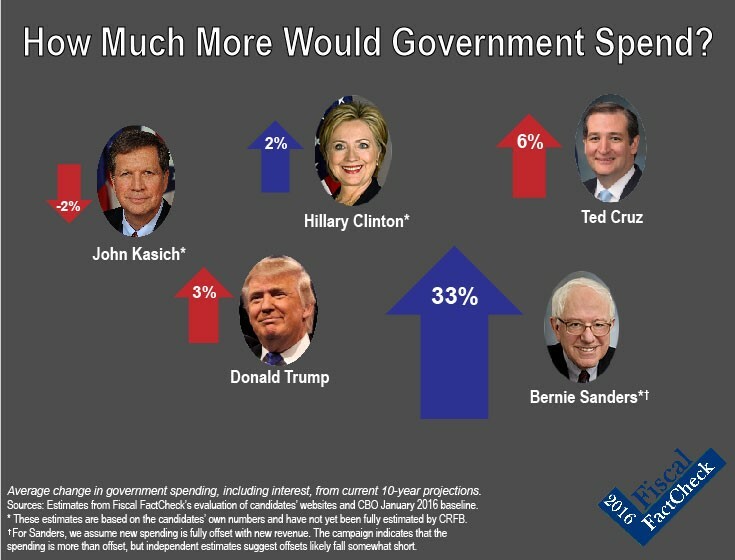 By comparison, Republican Sen. Ted Cruz of Texas would boost spending by 6 percent during that same period, as a percentage of GDP, while Clinton and GOP presidential frontrunner Donald Trump would hold spending to roughly the current projected levels as a percentage of the economy and Republican Ohio Gov. John Kasich would bring it down slightly. But Trump and Cruz have promoted tax cut proposals that if enacted would add trillions of dollars to the national debt over the coming decade, according to analyses by the non-partisan Tax Foundation. Based on traditional economic modeling of those tax packages, Trump’s plan would result in an $11.9 trillion loss of federal revenue over the coming decade and Cruz’s plan would cost $3.6 trillion. Clinton’s proposed tax cuts would result in $498 billion of foregone revenue for the Treasury. Sanders has boasted that he would pay for his highly ambitious proposals through steep tax increases on wealthy Americans and Wall Street investors. His tax proposal would boost federal income by $13.5 trillion over the coming decade, according to the Tax Foundation, with the lion’s share of that going for his proposed “single-payer” national health insurance program. Fiscal watchdog groups complained that Republicans and Democrats alike have ignored the long-term fiscal implications of CBO’s warnings. Trump in particular has boasted that his tax cuts would boost the economy and generate more tax revenue in the future, while scoffing at calls for long-term reforms of Social Security and other entitlements to save money. “At best, they are talking about paying for new initiatives, and that’s not enough,” he added.